J.D. 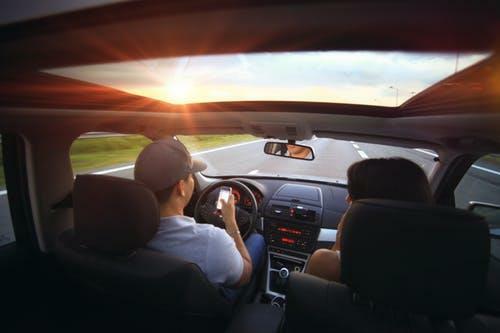 Power and Chicago-based Uptake Technologies are partnering to develop new automotive industry analytics products, in addition to analytics products for the utilities and telecommunications sector. 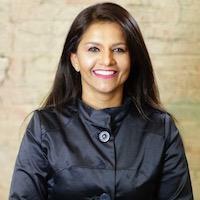 Learn about this month's member spotlight, from Nehal Gandhi, CEO at Ideology. 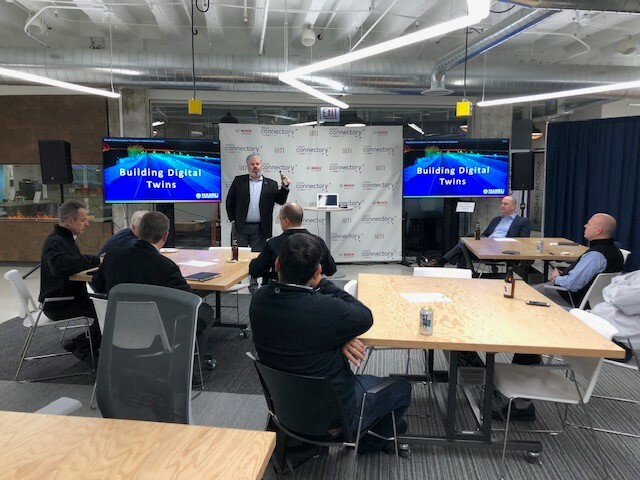 The Chicago Connectory recently launched a regular speaker series to help businesses tackle issues that can arise when working with the Internet of Things (IoT). 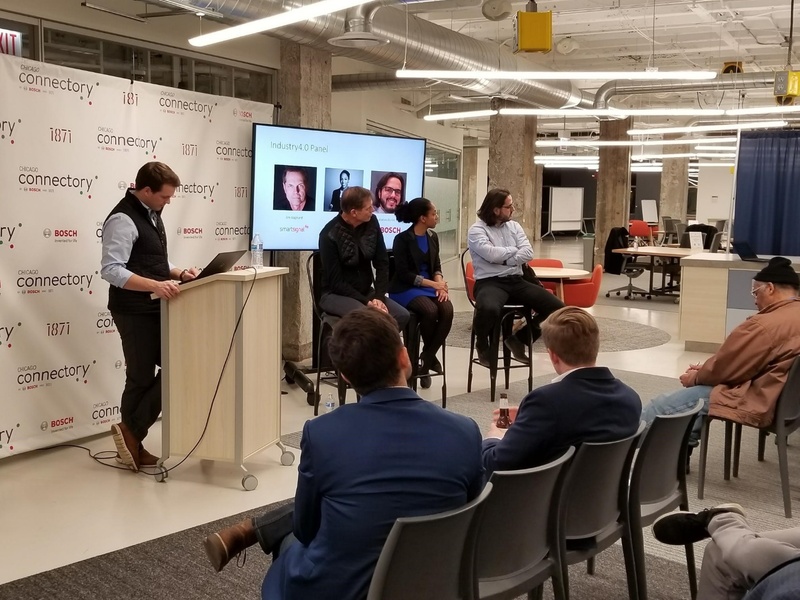 The Chicago Connectory hosted Sente Foundry’s ‘Innovation in Food Tech Meetup’. 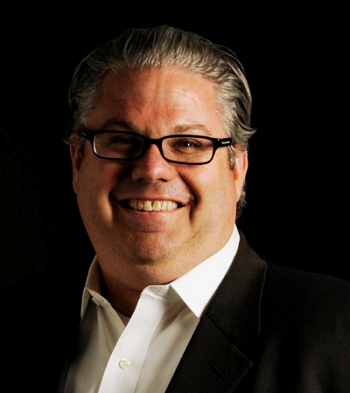 This event focused on how innovation and data is key to success in the food tech space. 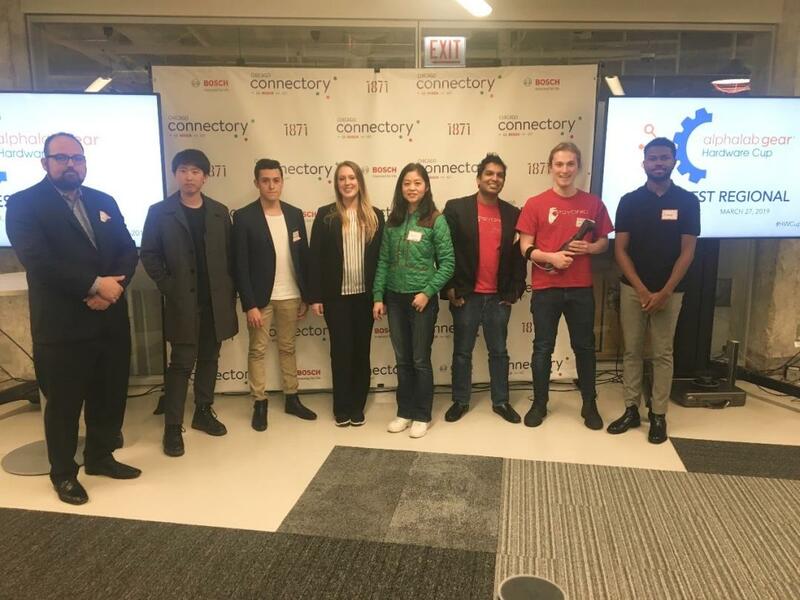 On the evening of March 27, the Chicago Connectory welcomed back AlphaLab Gear, to host the 2019 Hardware Cup Midwest Regionals. 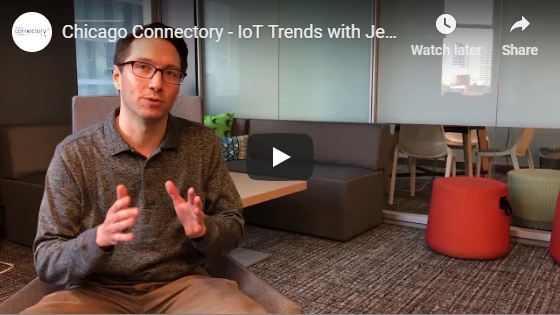 Watch the latest IoT Trends video to hear from Jeff Gristenthwaite, VP of product at Catalytic, as he talks about why automation is an IoT trend. 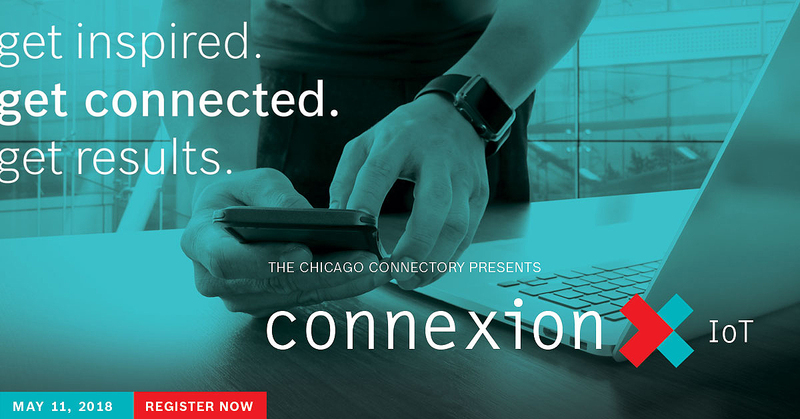 Verizon's fifth generation (5G) network is officially launching on April 11th in Chicago. The 5G technology will greatly support IoT, AI, autonomous vehicles, advanced robotics, wearable tech and other technologies. 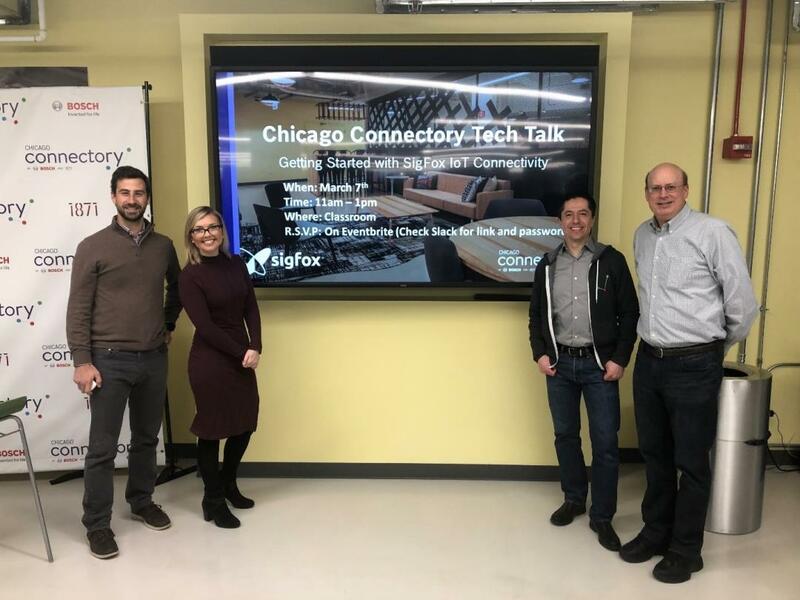 The Chicago Connectory welcomed Sigfox USA to present their ongoing activities to engage IoT entrepreneurs in the greater Chicago market. 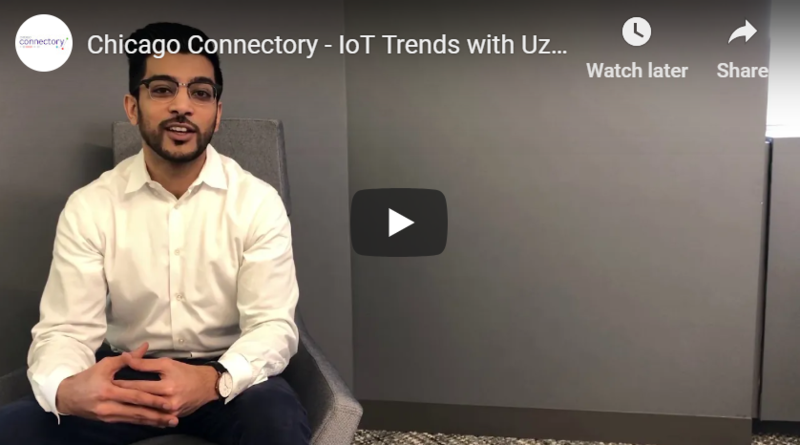 Watch the latest IoT Trends video to hear from Uzair Hussain, CEO at Cleu, as he discusses IoT controllers and their influences on consumers. 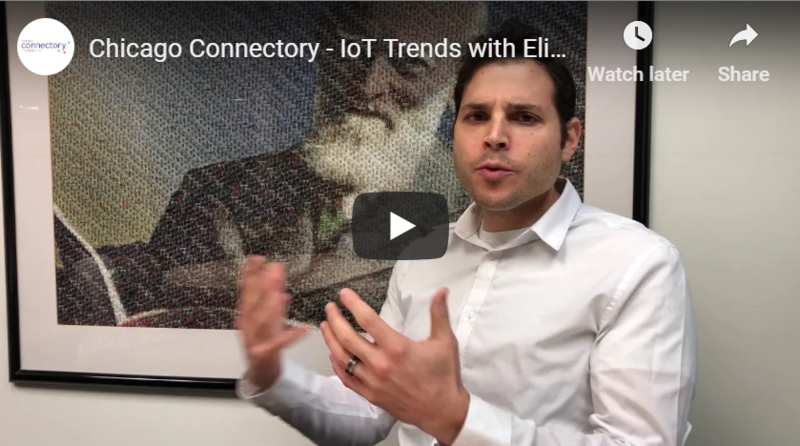 Watch the latest IoT Trends video to hear from Eli Share, Group IoT & Mobile Manager at Robert Bosch, LLC, as he discusses the importance of IoT business models. 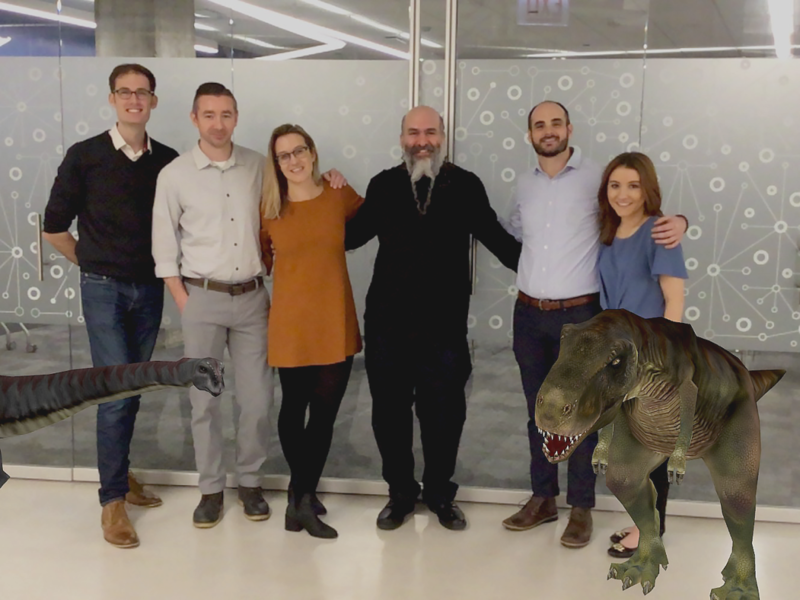 Chicago Connectory member, mLab, hosted its first live Tech Trends Today webinar series in the space focused on augmented reality (AR) . 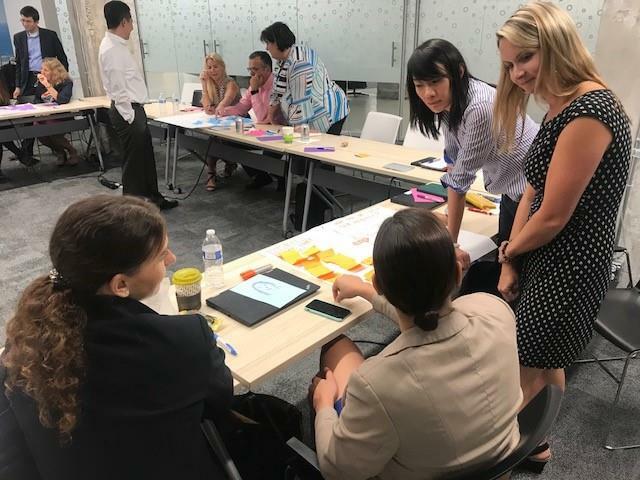 The Data & Human-Centered Design Meetup focused on how human-centered design and data analytics can come together. Guest speaker, Ann Conway, spoke about how design and data science specialists can collaborate to improve outcomes. 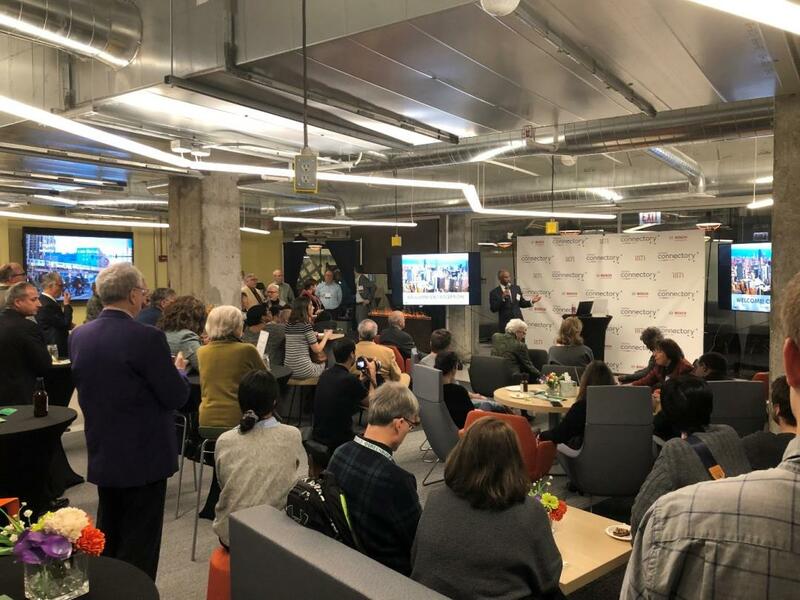 On February 1, the Chicago Connectory welcomed City Tech Collaborative and its key partners to the space as they announced the launch of a new cyber-security training pilot for women in Chicago. 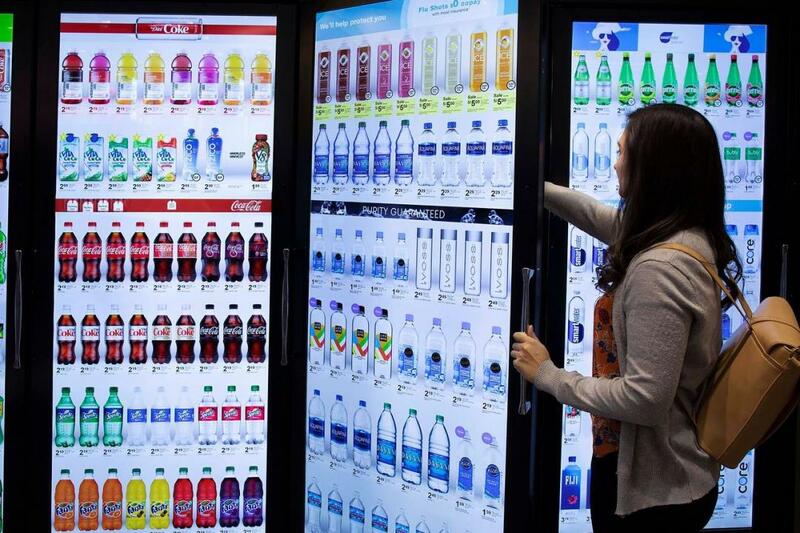 Walgreens Boots Alliance Inc. is testing a technology of “smart” displays that marketers can use to target ads for specific types of shoppers. 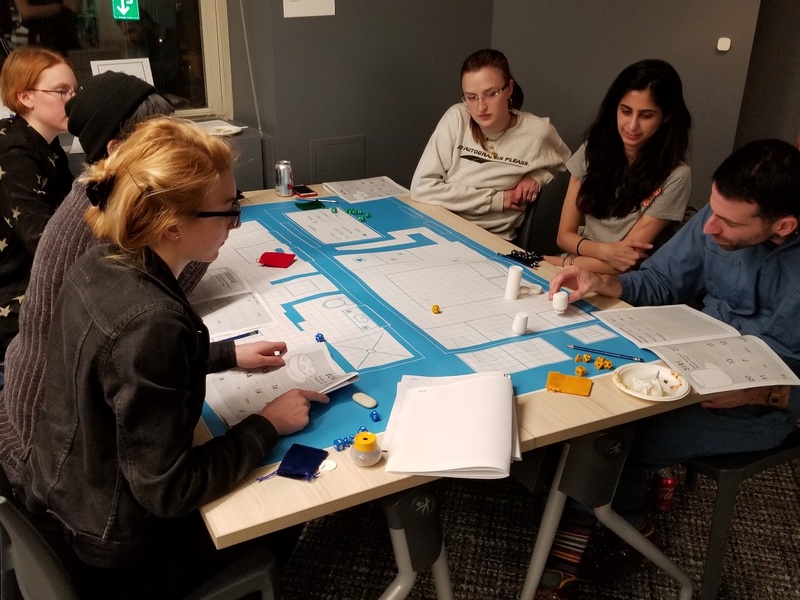 UXD Chicago is a passionate and innovative group that comes together to envision the future of design by hosting events that facilitate conversations, networking and learning from knowledgeable speakers. 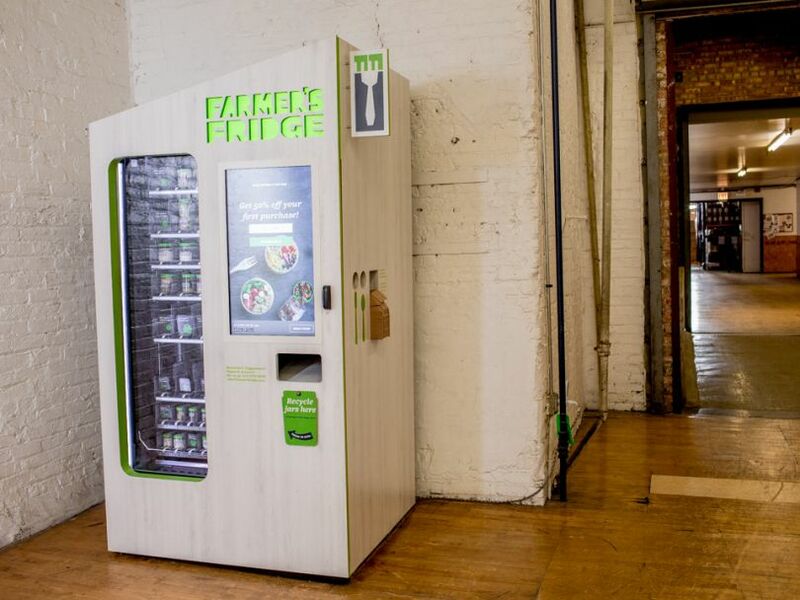 Farmer’s Fridge is a Chicago-based company that provides automated smart fridges stocked with chef-curated, restaurant-quality meals and snacks. 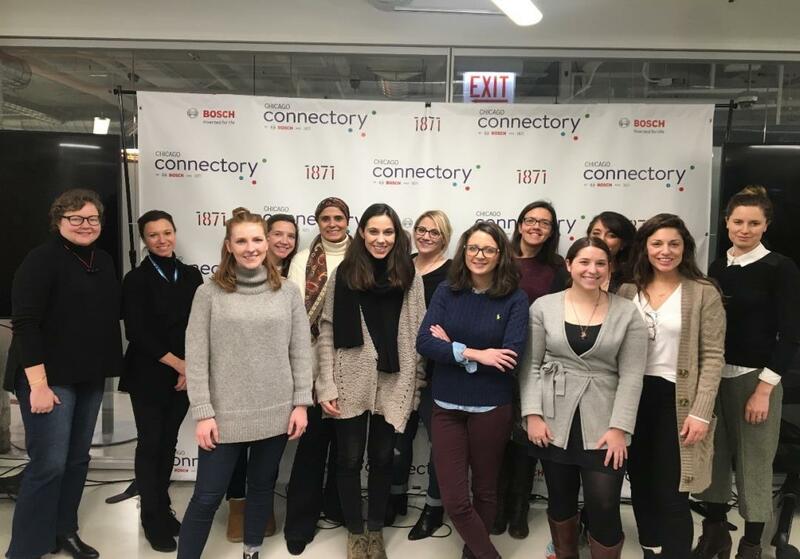 Chicago Connectory partner 1871, hosted the WiSTEM C8 Showcase on the evening of Dec. 11. 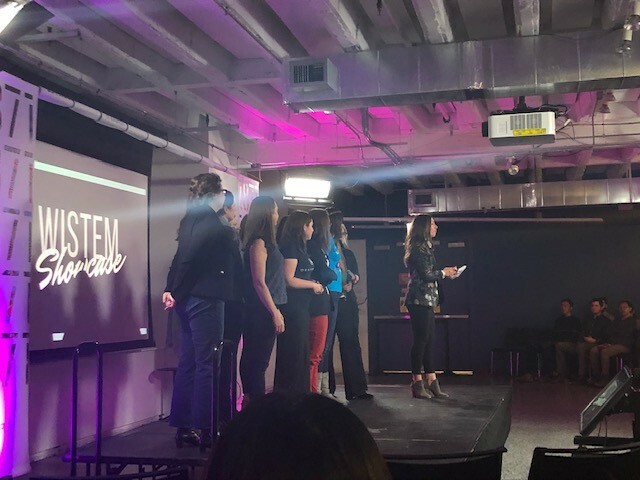 The event celebrated 10 inspirational women founders who were part of the eighth WiSTEM cohort at 1871. 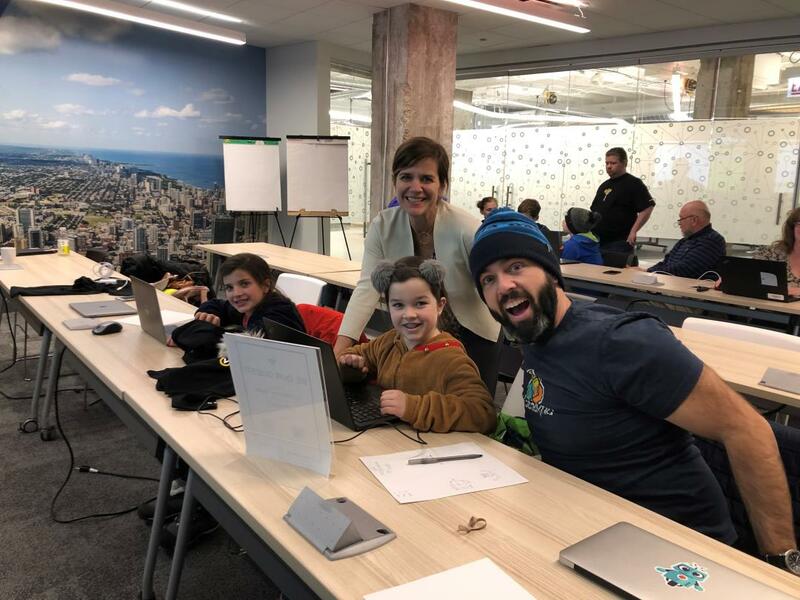 On Wednesday, December 5th, the Chicago Connectory hosted the Hour of Code, a movement aimed at bringing computer science and coding to children globally. 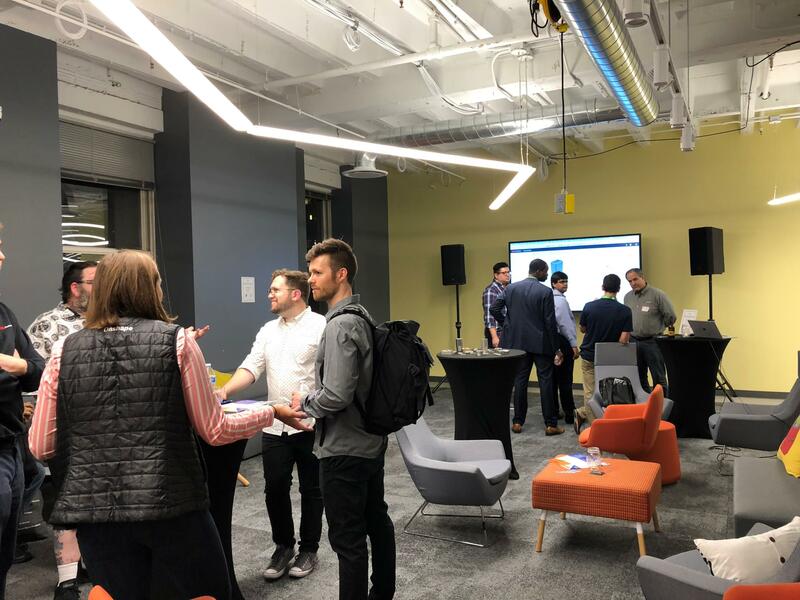 On Wednesday, Dec. 5 the Chicago Connectory hosted a "Digital Duplicate" meetup, sponsored by the Illinois Autonomous Vehicles Association (ILAVA). 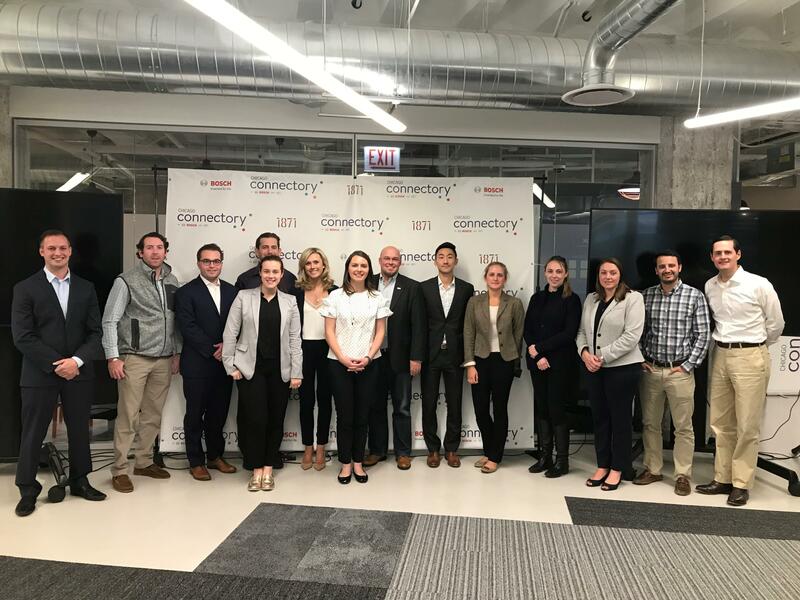 On Tuesday, Dec. 4, WiSTEM from 1871 visited the Chicago Connectory for a tour of the space and its IoT demos. 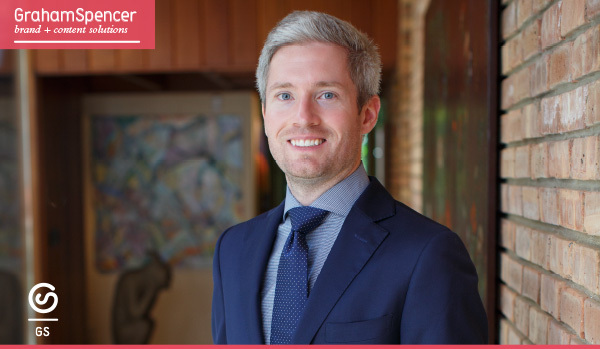 Learn about this month's member spotlight, from Thomas Clever, Managing Director and Co-Founder of CLEVER°FRANKE. 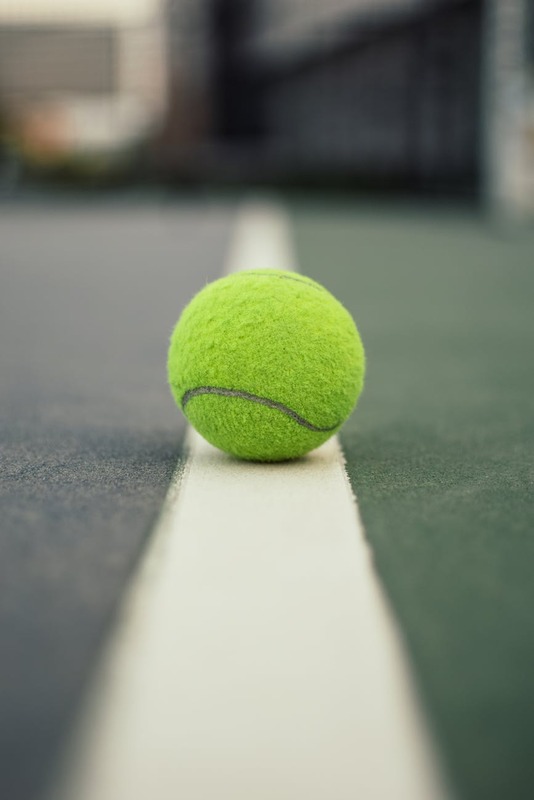 Chicago-based sporting company, Wilson, recently developed a sensor that can count the number of times a racket hits a ball, letting players know when it’s time to restring the frame. 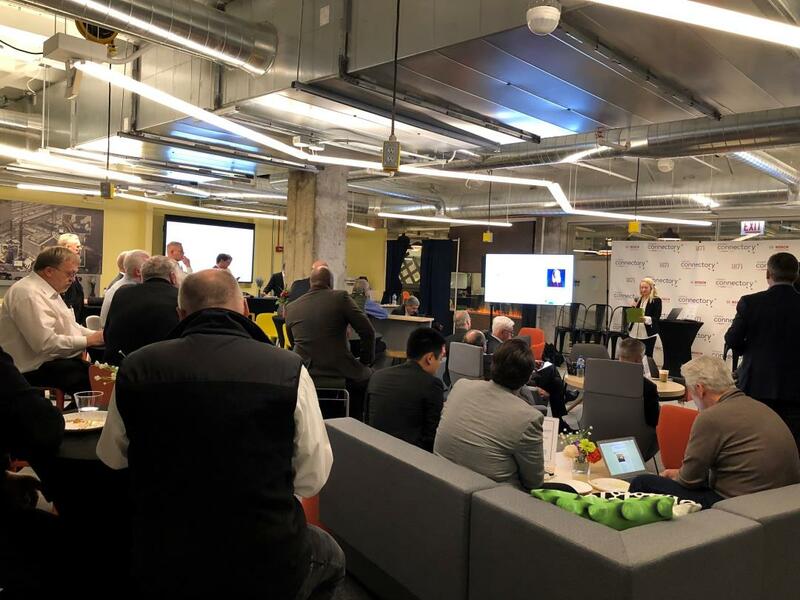 The Chicago Connectory hosted the Smart Manufacturing and Industrie 4.0 event where Germany-based and US-based smart manufacturing experts came together to provide keynote presentations, panel discussions and networking opportunities. 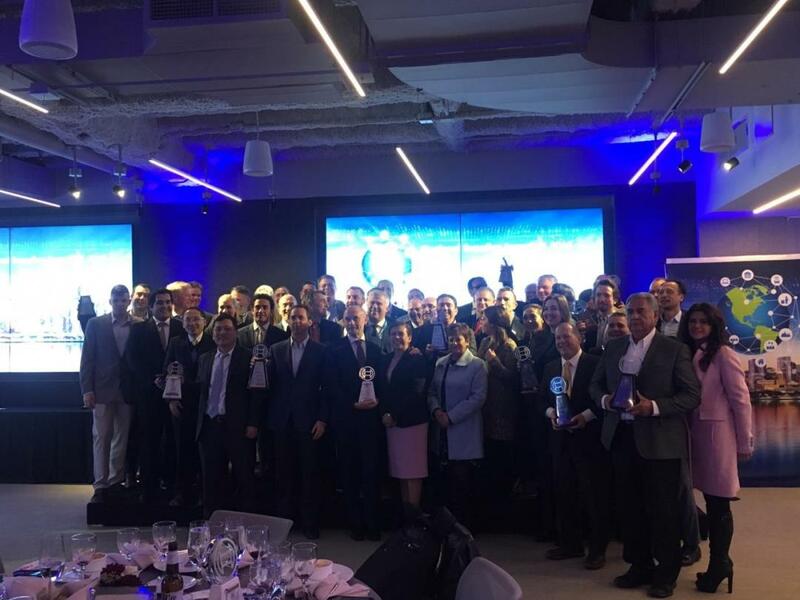 On Monday, Nov. 12, the Chicago Connectory hosted the 2018 Bosch North America Regional Supplier Awards. These ceremonies were held in various locations worldwide, each focusing on a different region. 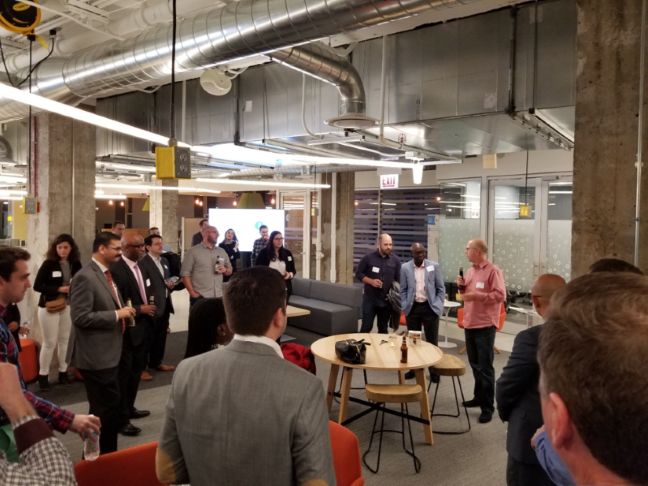 The Chicago Connectory welcomed the Center for Neighborhood Technology (CNT) as they hosted a reception for their community and the public to attend. 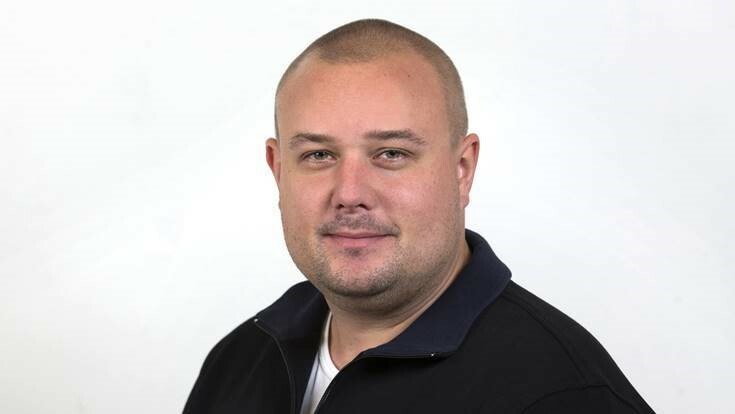 Watch the video from Bosch IoT Manager, Sebastian Moebius as he discusses “Edge Computing" as an IoT Trend. 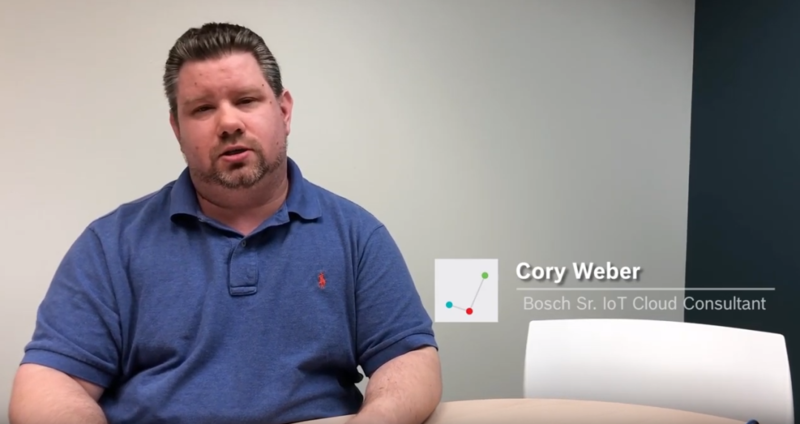 Watch the video from Bosch Sr. IoT Cloud Consultant, Cory Weber as he discusses “Machine Learning” as an IoT trend. 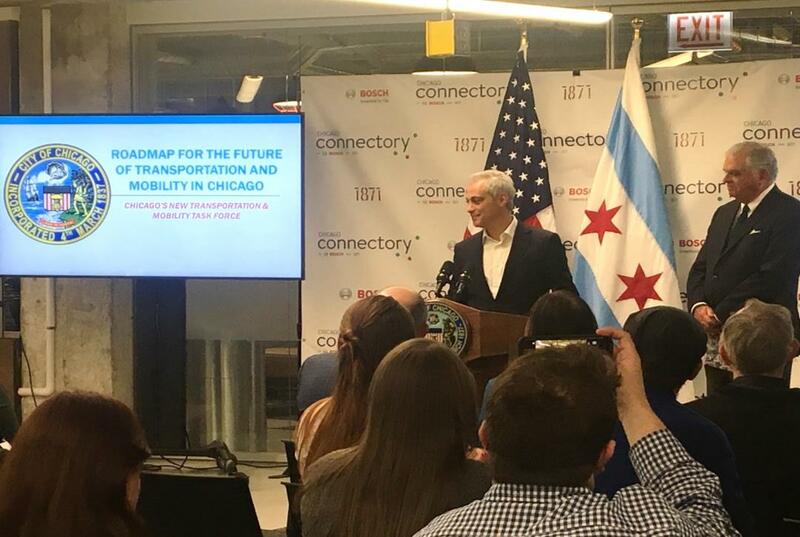 The Chicago Connectory hosted the second edition of a mobility hackathon on Friday, Oct. 19 and Saturday, Oct. 20. Promoted by Bosch and KPMG. 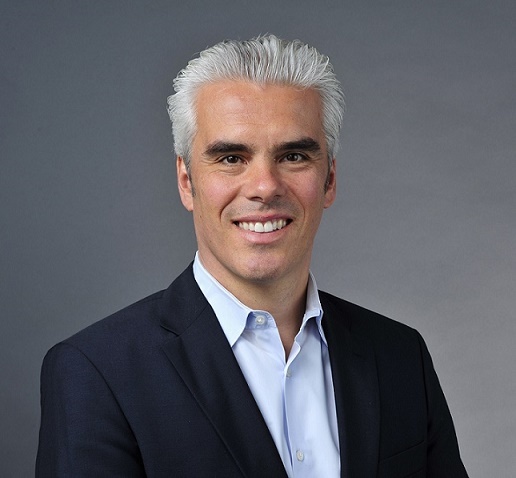 Watch the video from Bosch Director of Digital Business, Thomas Makosch as he discusses “Connected Construction” as an IoT trend. 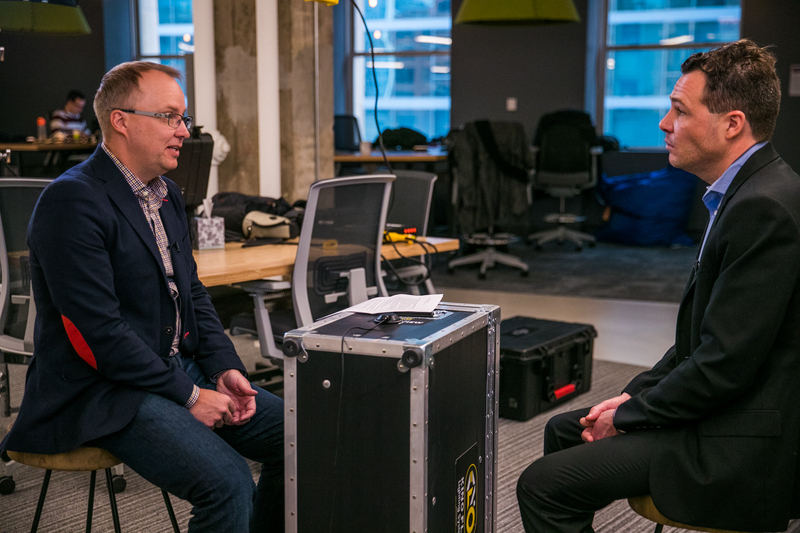 Learn what other companies in the Chicagoland area are doing to tackle different IoT-related challenges. With the invention of IoT, losing mail can become a thing of the past. 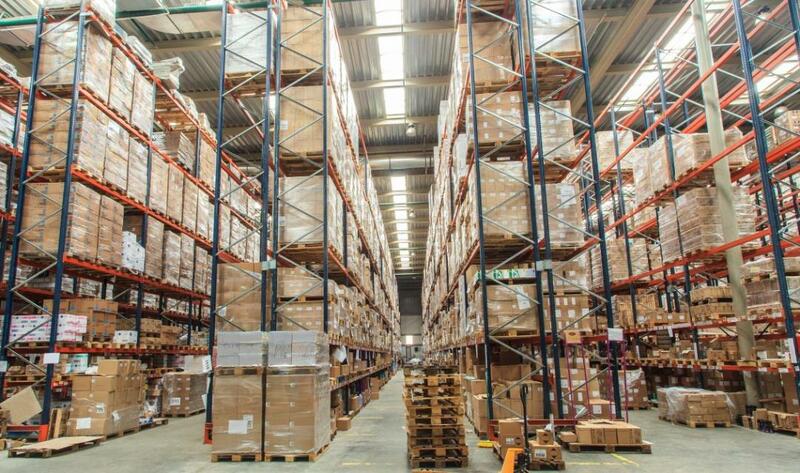 Hanhaa is a company that makes tracking technology that can be used when shipping all kinds of parcels. 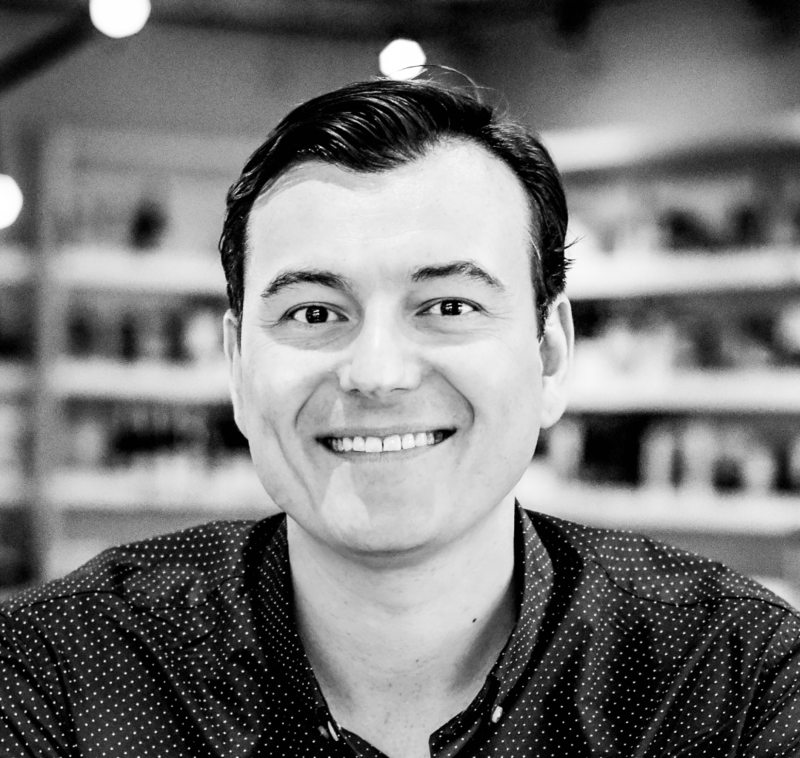 Learn about this month's member spotlight, Sente from Gerod Carantan, COO. 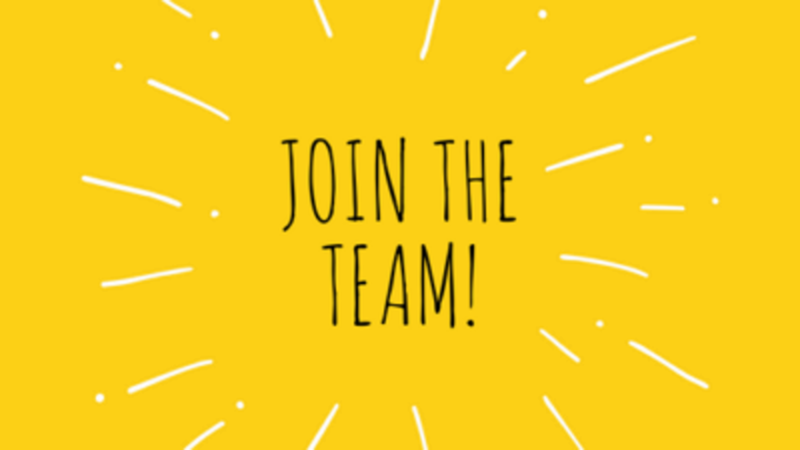 The Chicago Connectory is looking for a new Co-Creation and Innovation Space Consultant to join the team! 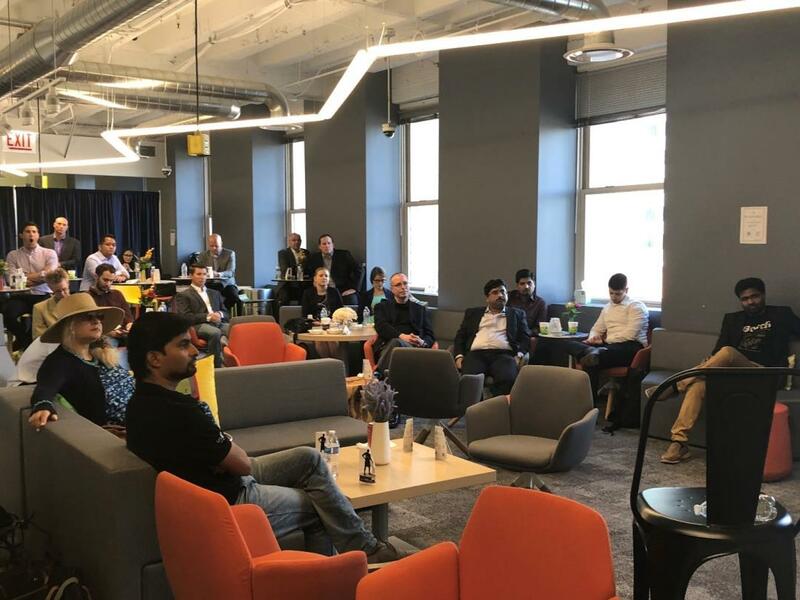 The Chicago Connectory hosted teams from Onshape and Desktop Metal to learn about their partnership. 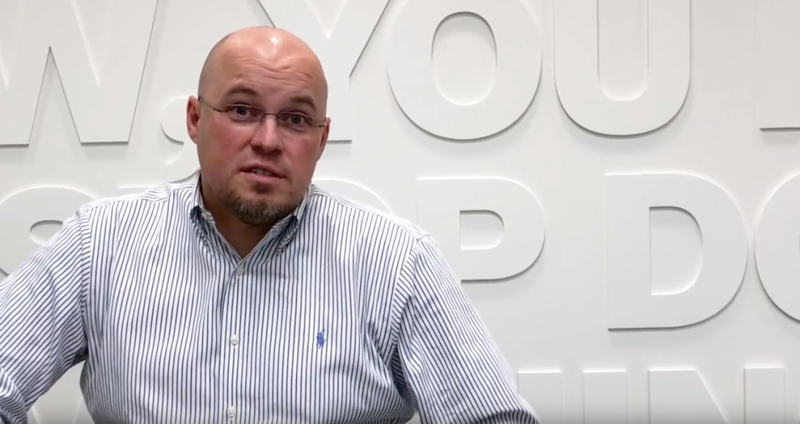 The two companies are working to bring innovation to mechanical design, metal 3D printing and manufacturing. 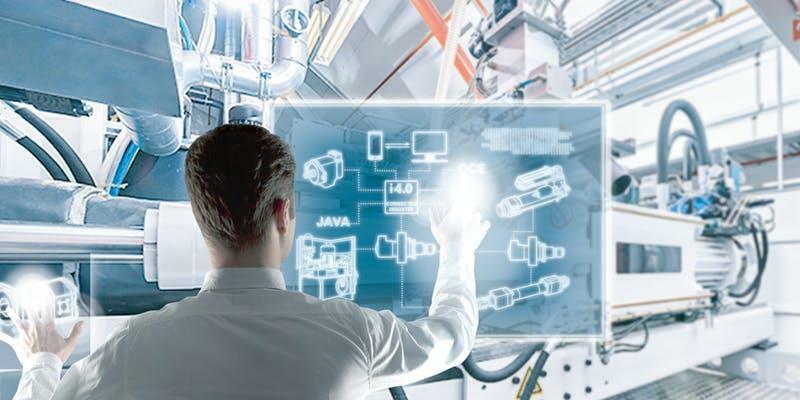 Industrial IoT (IIoT) relates particularly to its application in manufacturing and logistics. It is capable of increasing productivity of almost every process along a company’s value chain, as well as increasing product quality. 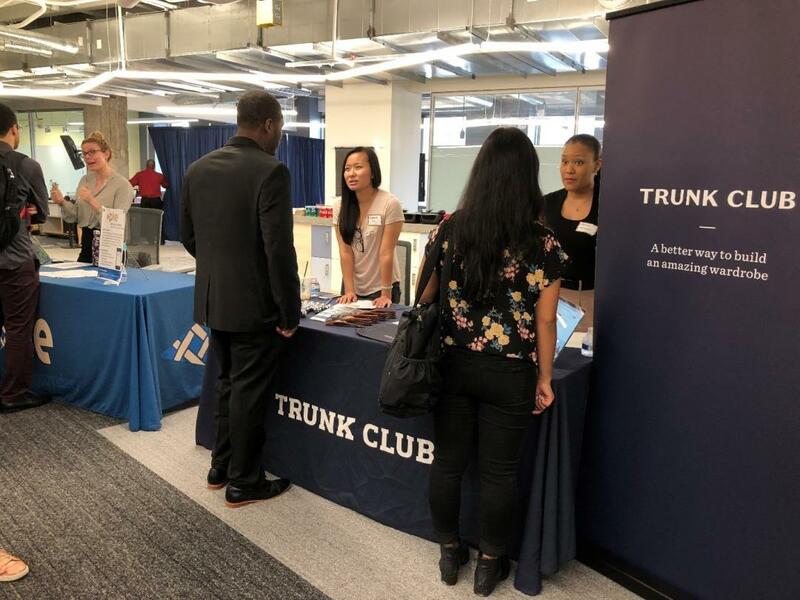 The Chicago Connectory hosted the diversiTECH Hiring Fair for minorities and welcomed employer companies focused in technology, web and mobile. 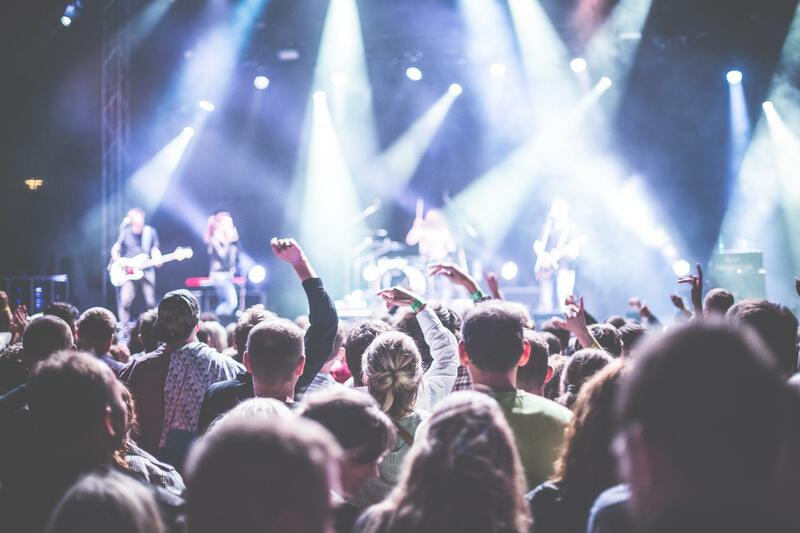 Earlier this month, Bosch worked with Array of Things to conduct a mobility study at the Lollapallooza music festival. 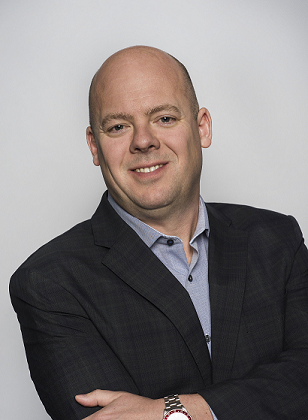 Learn more about the Connectory's newest IoT member, Frost Control Systems. 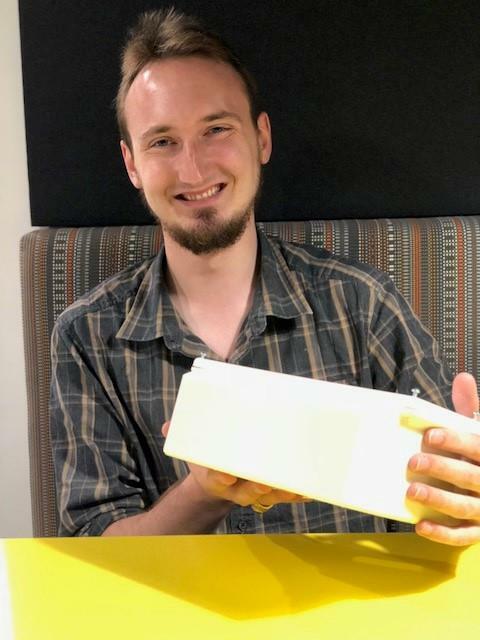 Winner of the Connexion IoT showcase, Frost Control Systems is a sensor-based solution for smart city deicing. 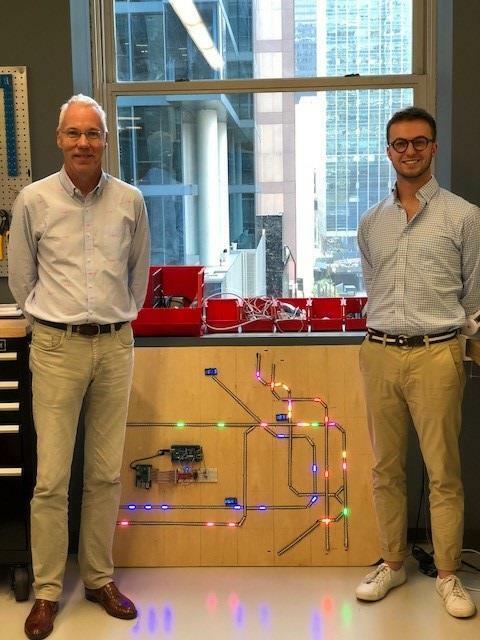 Windy City Labs Manages the Prototyping Lab at the Chicago Connectory! 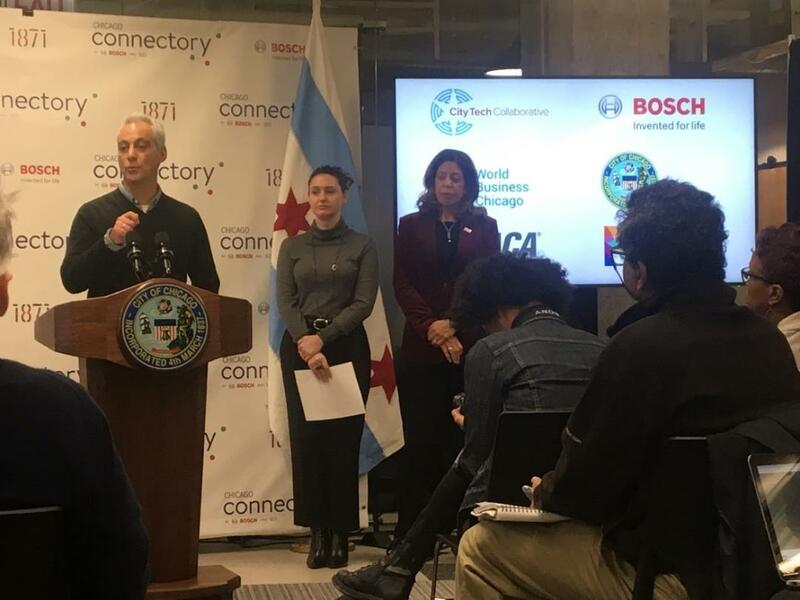 Windy City Lab is one of many partners and start-ups that work from the Chicago Connectory. The lab provides consulting and workshops on all aspects of building smart physical products that tie into the cloud and one's phone. 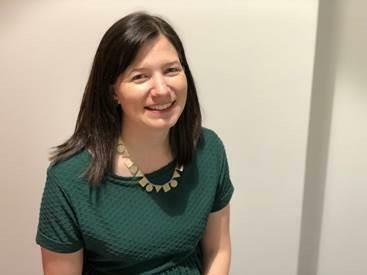 Learn about this month's member spotlight, DemandTrans from Charlotte Frei, Director of Transit Research. 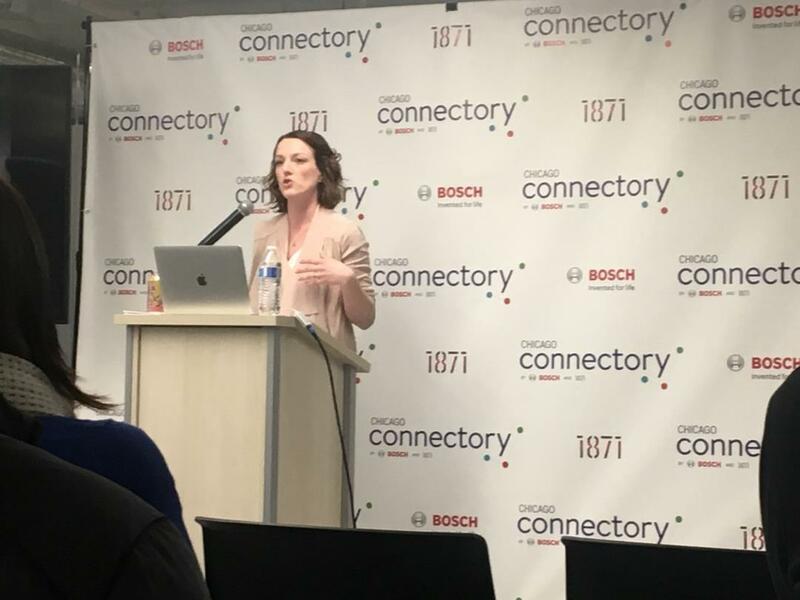 The Chicago Connectory partnered with 1871 to host a WISTEM mentorship kick-off event for about 25 Bosch directors in the Chicagoland area. 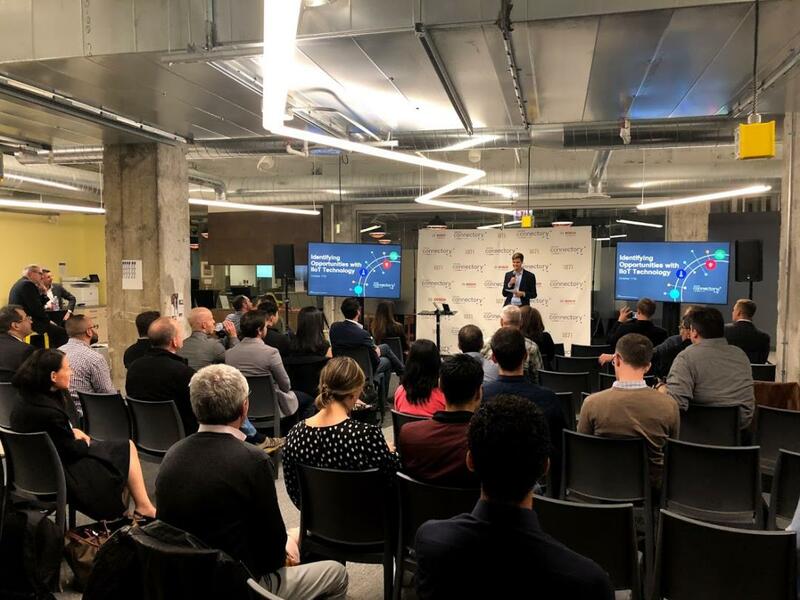 More than 30 people attended the event, where they learned the concepts and technologies that underpin the digital transformation of manufacturing. 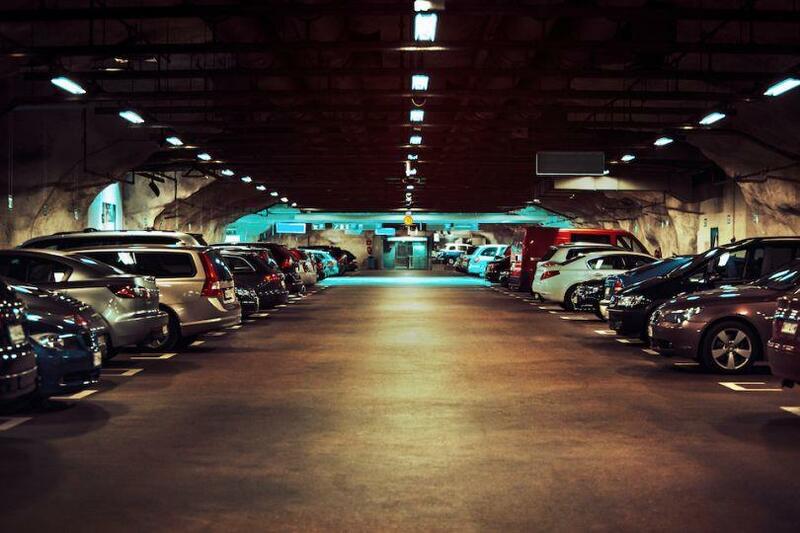 SpotHero, the parking technology company, announced in early July 2018 that more than 500 of its facilities in Chicago are now autonomous-vehicle ready. 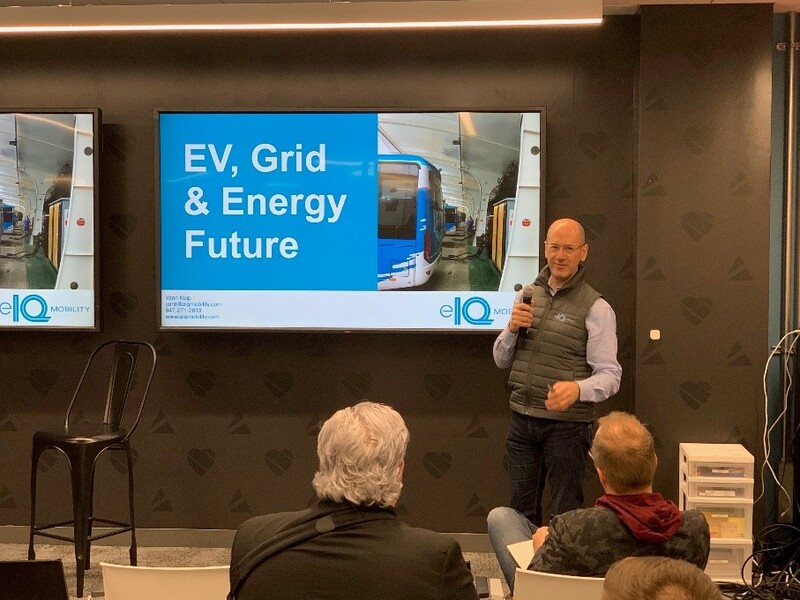 Watch the video to hear from Bosch Associate and Industrial Internet of Things Expert Uwe Roehm talk about “Connected Industry” as an IoT trend. SpaceBot is a spatial intelligence company that collects data about how people use physical buildings and spaces. 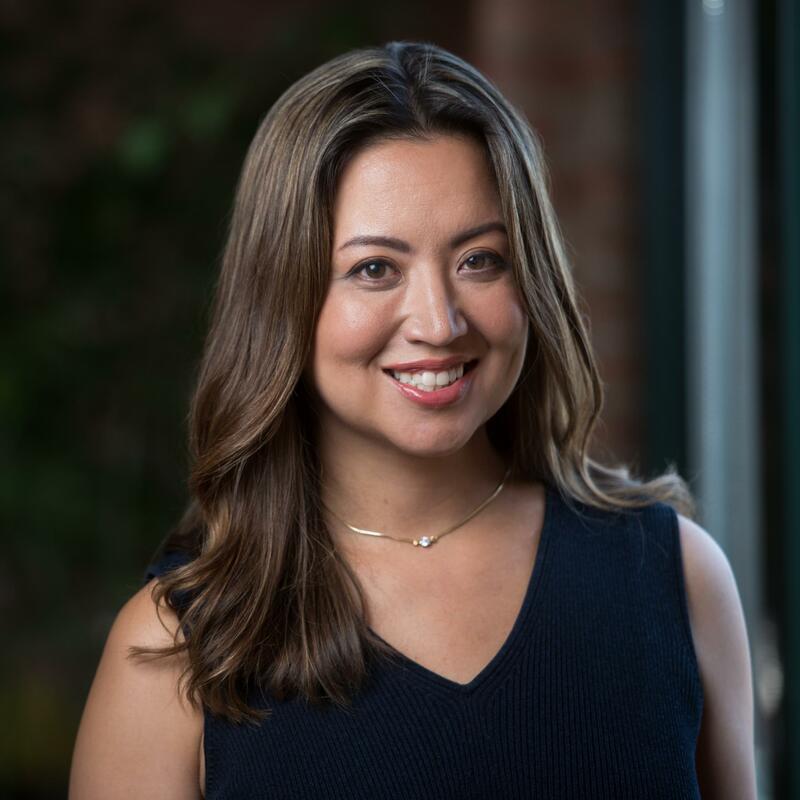 Venture capitalist, Rumi Morales, was announced as a new partner to the blockchain investment firm Outlier Ventures. 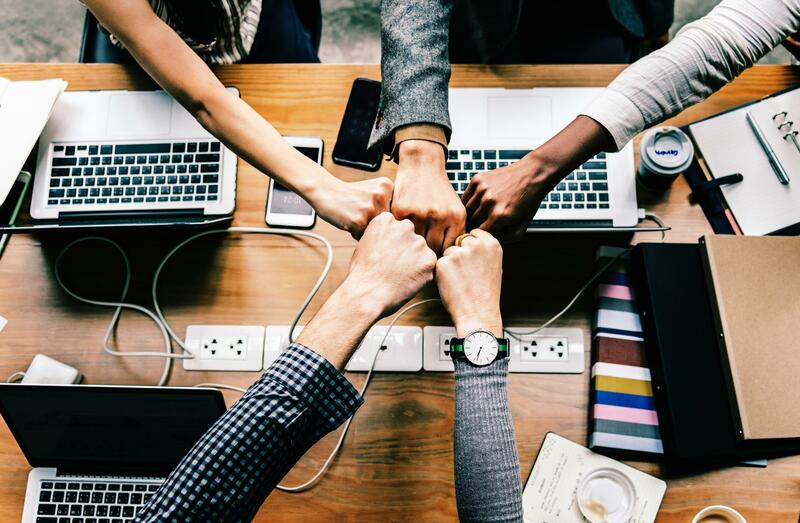 Six examples describing how cities are becoming “smart” by leveraging IoT to improve urban life and boost the happiness of city dwellers. 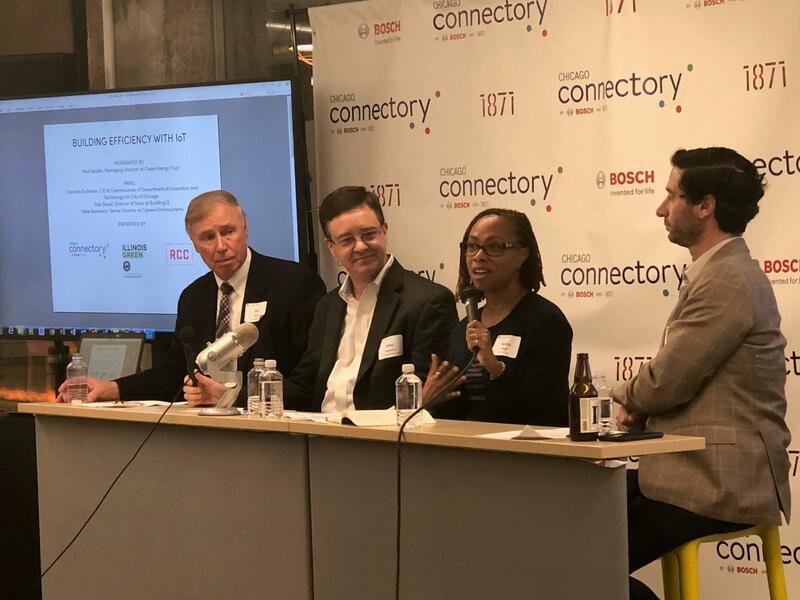 On May 11th, the Chicago Connectory hosted the first ever Connexion IoT event at the Chicago Connectory and 1871. 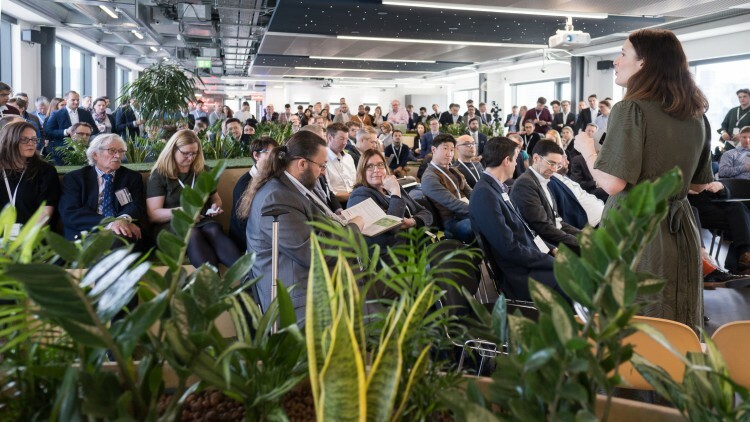 More than 500 people from Bosch and other global companies attended to learn about IoT topics from 18 high-profile thought leaders, joined two featured meetups, experienced an IoT startup pitch contest, and visited an exhibition space where more than 40 interactive sponsors showcased their IoT solutions, including Microsoft, CDW and more! 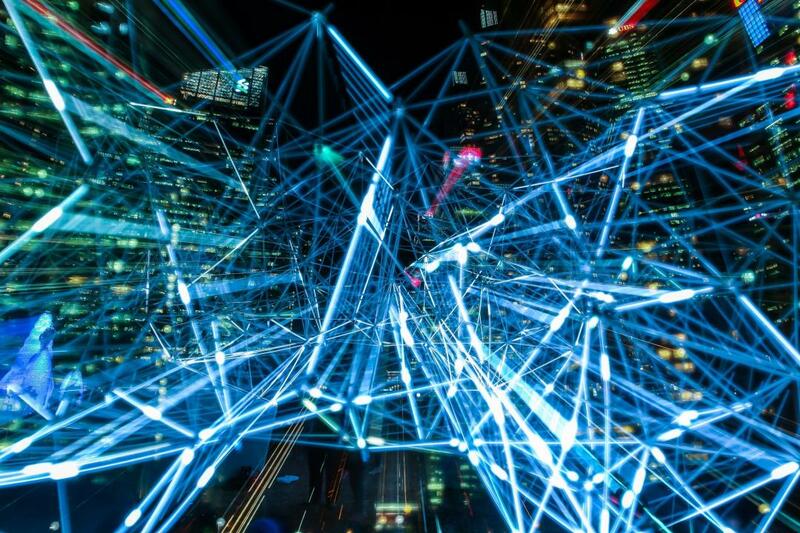 The Internet of things need to be intelligent, not just connected, as the true value of IoT is not just making things connected but focuses on bringing intelligence to these devices. 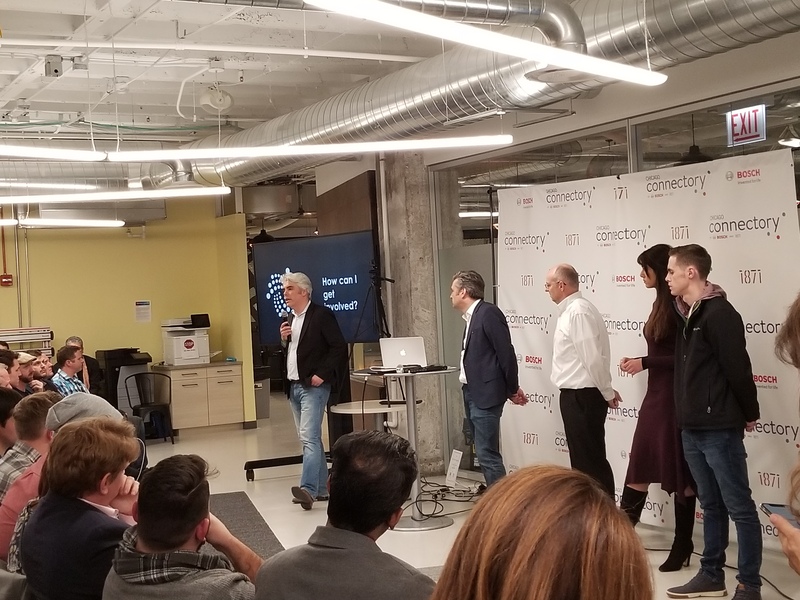 On Wednesday, May 16, the Chicago Connectory and SAP.iO partnered in hosting a captivating discussion about what “IoT meets AI” means and how corporations can engage with startups to bring these practical applications to the enterprise. 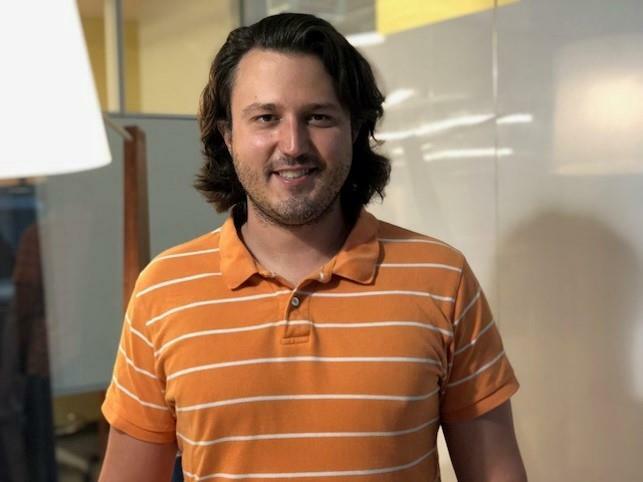 Learn about futuristic consumer IoT products from Mitch Carrel, co-founder and CEO of Proxfinity. 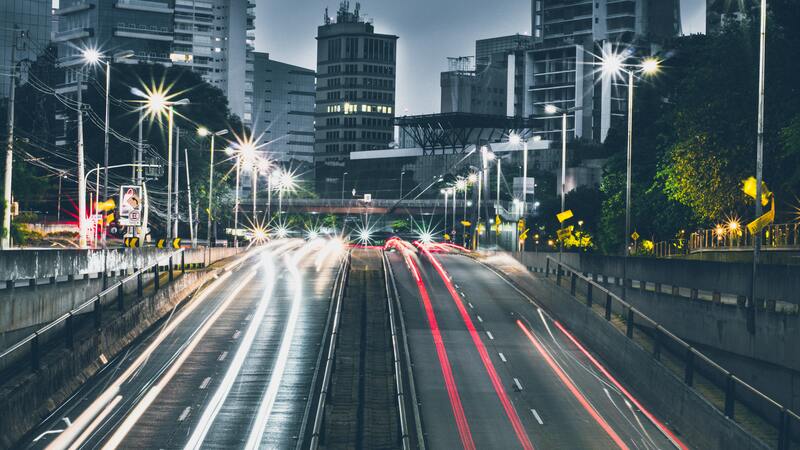 Learn about the impact of IoT on transportation featuring a panel of experts from start-ups and local government. 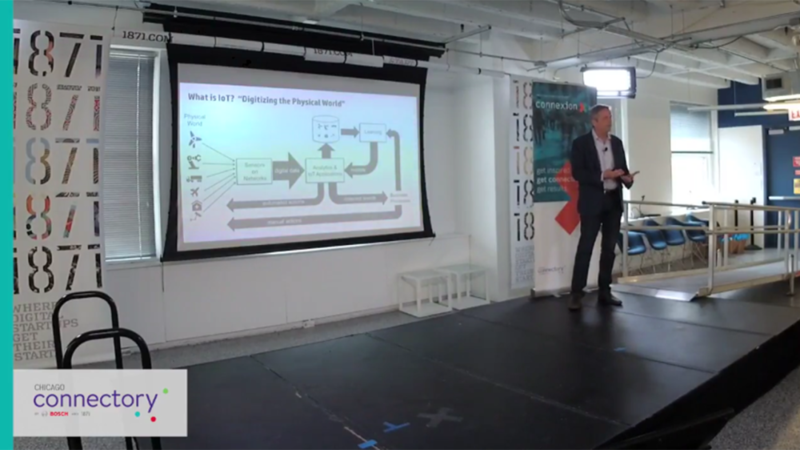 Watch the official Pitch Competition from Connexion IoT, sponsored by sente.link, where six different start-ups gave short pitches on their innovative and IoT-related products. 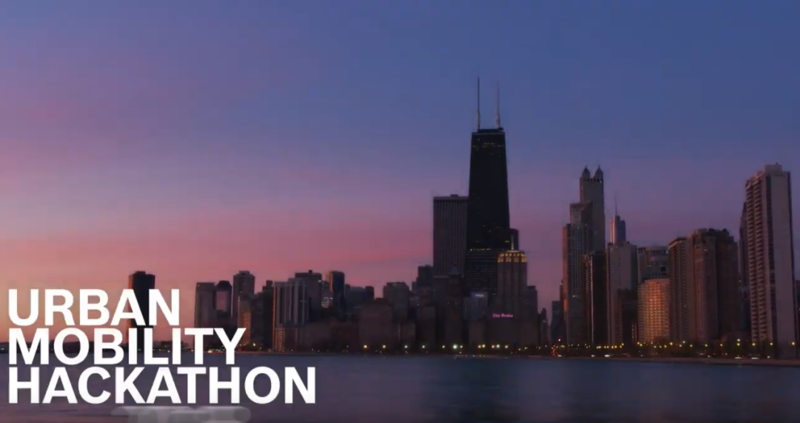 Watch this panel about smart city initiatives from local, city and state of Illinois governments. 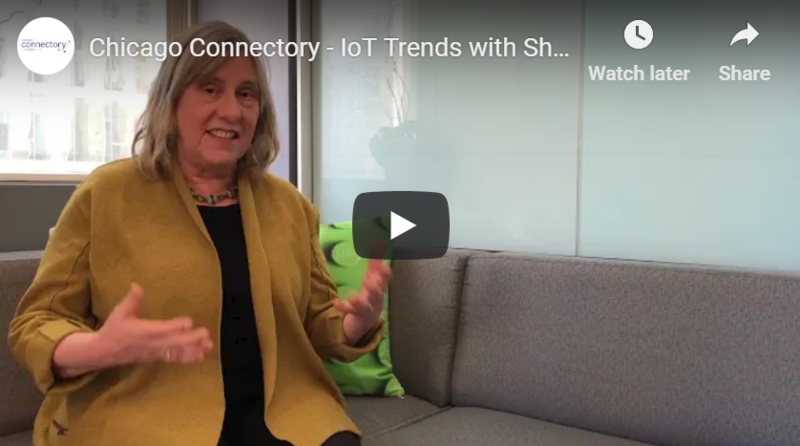 This talk, presented by Lin Nease, focuses on the history of IoT and defining various enterprise uses for IoT with a wide variety of use cases and examples. 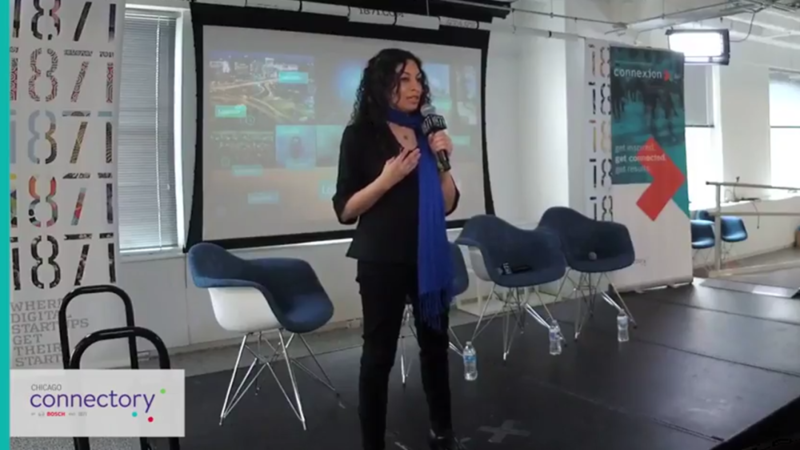 Monali Shah, director of Intelligent Transportation at HERE, mentions use cases from around the world and focuses on specific smart city trends. 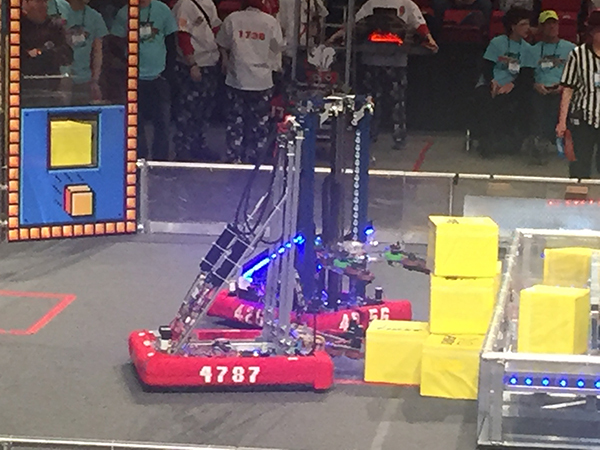 Earlier this month, the Chicago Connectory hosted “Team Axiom,” Chicago's Northside College Prep High School's robotics team to participate at their first travel competition in Peoria, Ill and a local competition in Chicago. 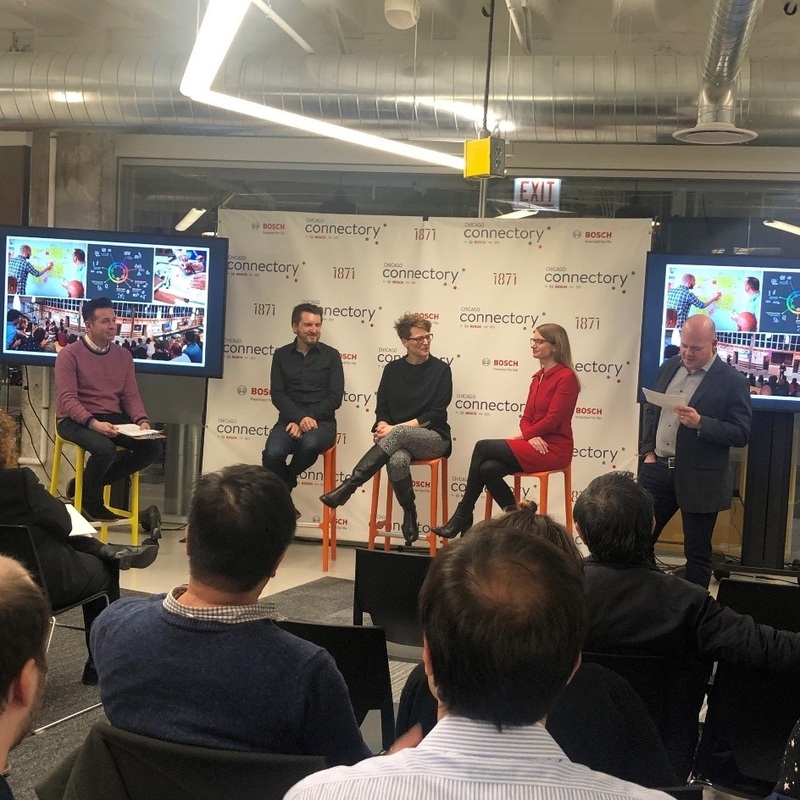 Infant death rates, athlete hydration and 3D printed food were three of the topics addressed at the Chicago Connectory for the Alphalab Gear Hardware Cup on Tuesday, March 3. 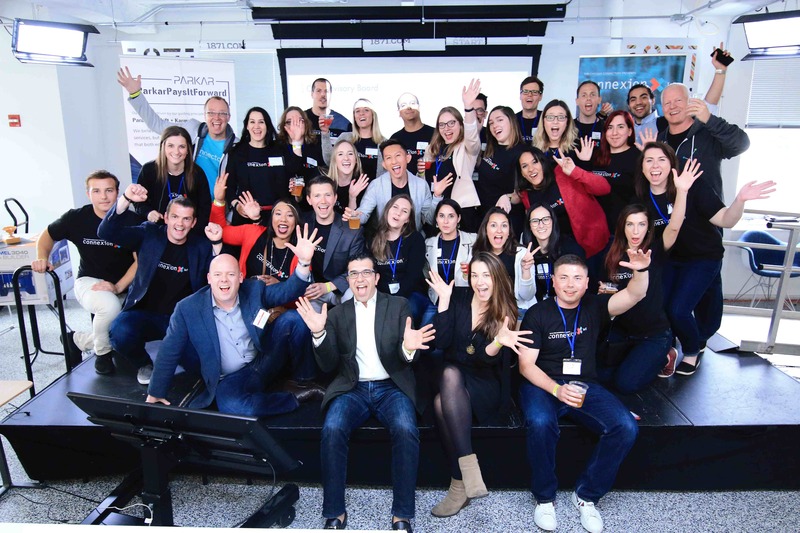 Six early-stage hardware startups pitched their ideas to judges, which came from companies such as TechStars, M25 and Pritzker Group Venture Capital, among others. 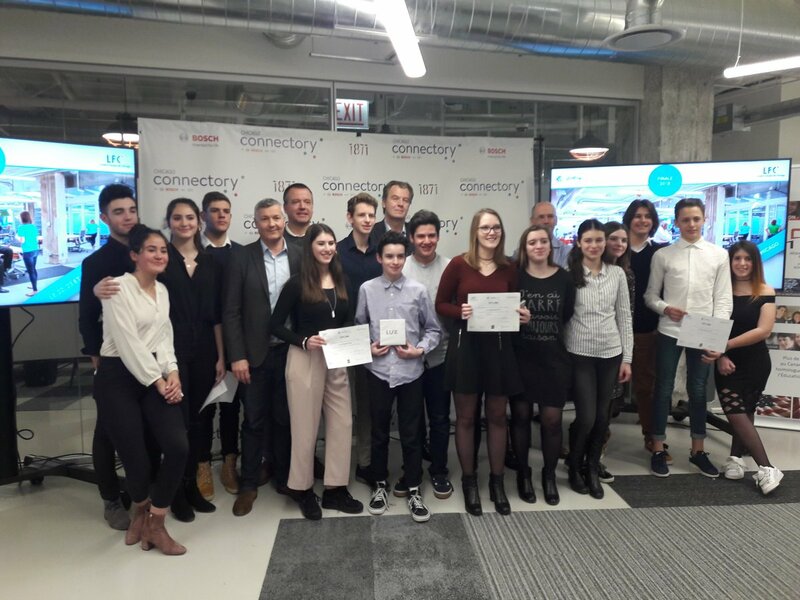 The Chicago Connectory hosted the Lycée Français (The French International School) Hackathon from Thursday, March 22 through Saturday, March 24. 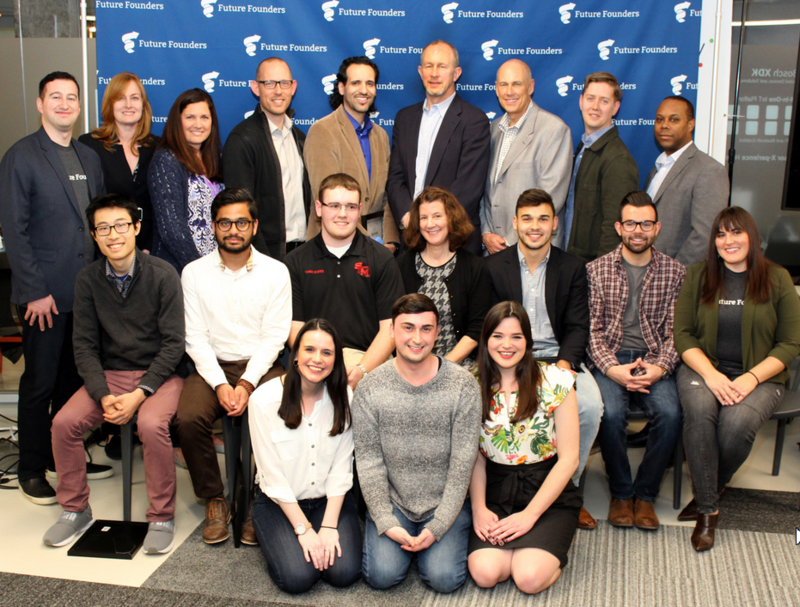 The event served as the French-American finale of Start’up Lycée 2018, an event where students from different schools developed business models and pitches before presenting to local judges. 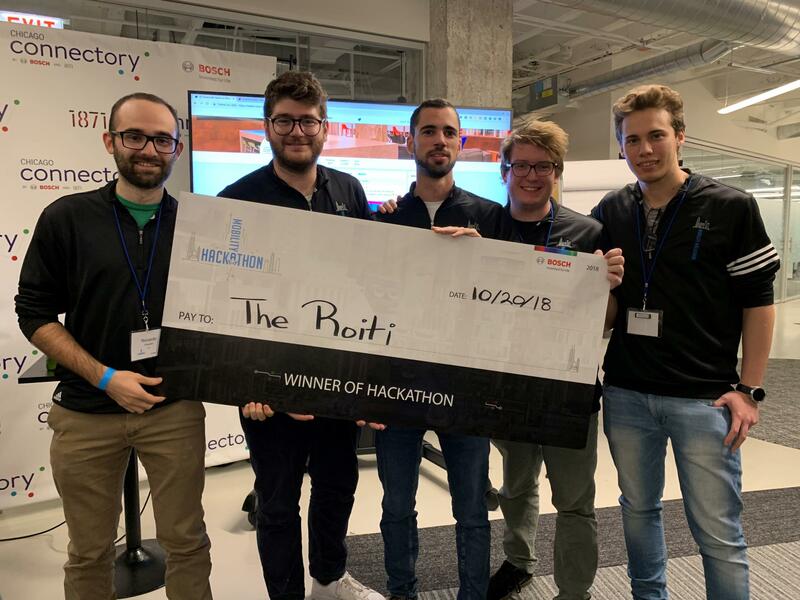 Nine teams participated in the event, including top teams from French schools in Dijon and Auriol (Marseille), as well as U.S. schools in New York and San Francisco, California. 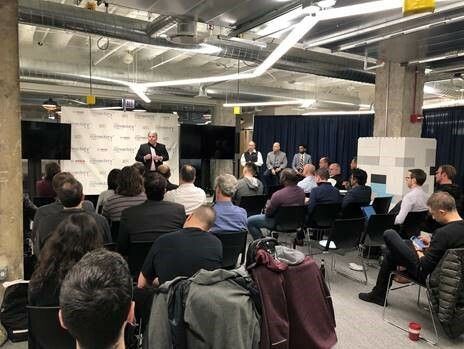 On Tuesday, Feb. 27, the Chicago Connectory played host to the first of six Chicago Industry 4.0 Tech Series events. 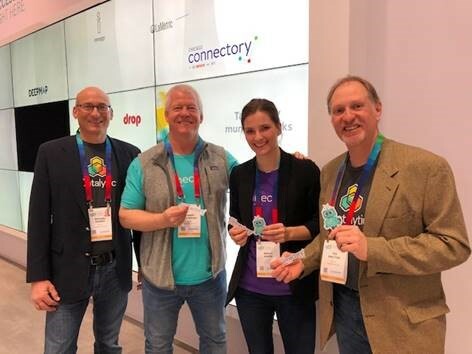 Connectory visitors can now experience the IoT through a new interactive demo provided by Losant and Sigfox. 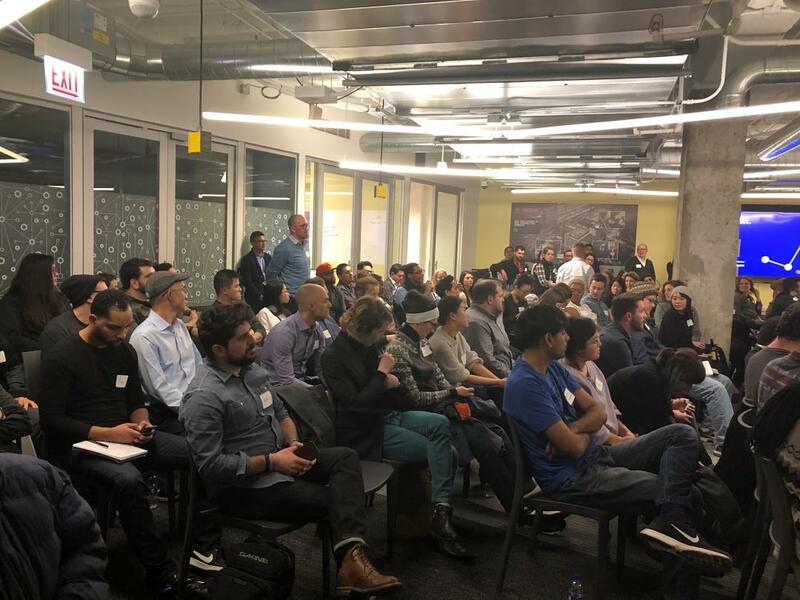 On Tuesday, Dec. 12th, The Chicago Connectory hosted the third IOTA meetup with a crowd of approximately 250 attendees on site and more than 2,500 participants watching a livestream. The Chicago Connectory and DePaul University were at the center of the innovation landscape in Chicago as leaders from Bosch, Abbott, General Electric, IBM, and more gathered for a reception on the evening of November 9, preceding the Optimizing Digital Innovation Conference at DePaul on November 10. 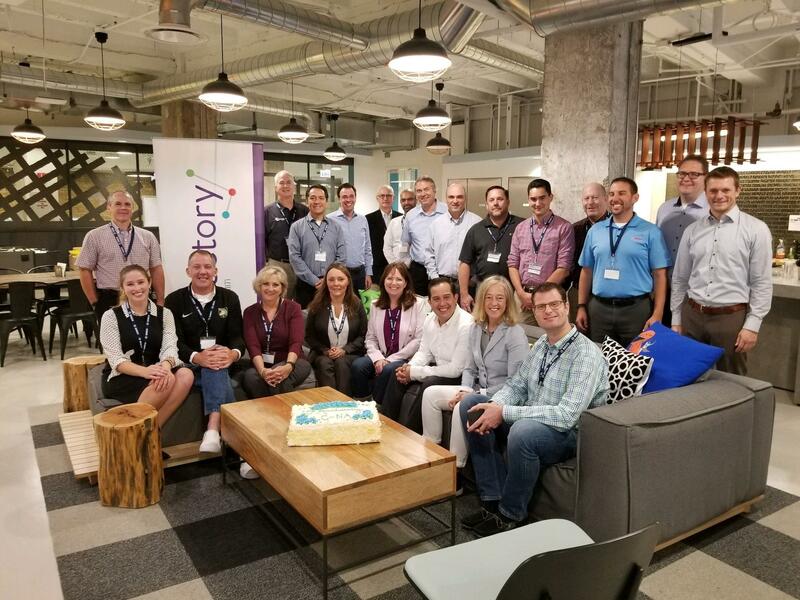 Welcome to the new and improved Chicago Connectory website!